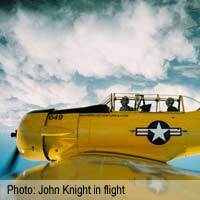 After some bad flying experiences, John Knight vowed he would never fly again, but his job meant that sometimes flying would be the only viable form of transport. Here, John records his experiences and how he overcame his flying fears. Frequently over the years I have made numerous flights, for work and pleasure, to many parts of the world and I got very used to flying in a variety of aircraft and weather conditions. Being rocked around in heavy turbulence during storms does not normally bother me but two memorable journeys, years apart, almost put me off flying forever and took some time to get over. My first experience of flying in a commercial aircraft was in the mid seventies on a working journey to the Orkney Islands from Heathrow airport and this involved changing aircraft at Inverness. Needless to say I was both excited and a little apprehensive about these first flights but I was reassured by a fellow passenger seated next to me that he flew frequently and that flying was smoother than a bus ride. Finally the jet aircraft rumbled down the runway and took off with me holding on tightly to my seat, it then climbed and levelled out into a very smooth cruise and before very long we were landing at Inverness - no problem with this flying lark so far.We had lunch in the small restaurant at the airport and were sat very close to a couple of pilots who were chatting loudly, probably for our benefit, about the different parts that had broken or fallen off aircraft they had flown. My doubts about flying were quickly re-asserted! The aircraft that took us to Kirkwall Airport was a four engine propeller type, that looked like it had seen service in World War Two, and different parts of its interior rattled depending on the speed of the engines. Worst still the wings moved up and down while in flight like a flapping bird and the previously overheard conversation between the two pilots came flooding back to me. The aircraft landed safely and without any events but I was nervous about flying for sometime after that. Some years later my work called for me to make a trip to Holland which involved catching one of the city hopper type aircraft from Gatwick to Schipol airport. It was a very windy and blustery day when I checked in at Gatwick and I was warned that there may be delays or cancellations to my flight due to the poor weather conditions. While I was waiting in the lounge you could hear the wind whistling loudly around the outside of the building and I seriously thought that my flight would be cancelled and so started to make new plans for this trip for the following day. To my surprise the flight boarded on time and taxied almost drunkenly to a holding point where it came to a halt. While it was holding, the wind rocked the aircraft violently from side to side and I thought that it was surely going to abandon take off in these conditions - it didn't! Instead it staggered down the runway and took off rising slowly and occasionally dropping violently which caused some passengers, me included, to take sharp intakes of breath each time this happened. Somehow we got to cruising altitude where the aircraft continued to go up and down like a roller coaster shuddering each time it reached the bottom of its descent. The landing at Schipol was also very scary. The nose of the aircraft was pointing steeply downwards and only lifted when we were very close to the runway and landed almost instantly. A breathless pilot made an announcement apologising to those passengers who did not like this type of flying and hoped that those who did had enjoyed it. I think the only smiling faces on other passengers that I saw were from the relief at being down on the ground in one piece! A few days later I made the return trip back to Gatwick after convincing myself that the outbound journey had been a fluke and the return trip would be fine, it wasn't - it was worse. On this even bumpier flight something hit me on the back of the legs. When I looked down on the floor I found my life jacket had detached itself from under my seat and was rolling on the floor in front me - an omen? I made a promise to myself that if we safely landed that I would not fly again. We landed safely and I told myself that I was never going to get on one of those things again. The snag with that was my job required me to regularly fly and if I didn't fly then I would not have a job - a real dilemma. My solution was to ring up a local flying school and explain what had happened to me and asked for a trial flight. The logic behind this was that if the flight became too much for me I could ask the instructor to take me back to ground when I chose. The flight went well, so well that to my great surprise I went on to gain my PPL, Private Pilots Licence, two years later!